PRESIDENT John Magufuli has castigated the ICC for interfering with the Burundian affairs without consulting the leaders of the East African Community (EAC), a move that retrogress the progress realised by the regional block, so far. According to a statement issued, yesterday, by the Director of Presidential Communications, Gerson Msigwa, President Magufuli explained that the situation in Burundi is not as bad as being said, for a huge number of refugees from that country had already returned home. He made the remarks when wrapping up his three-day visit to Uganda before he was accompanied to Mutukula border post by the country's Vice-President, Edward Kiwanuka Ssekandi, yesterday. He went on to note that other refugees who remained are in the process of returning to Burundi. 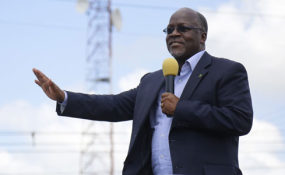 "However, leaders responsible in resolving the crisis have already planned to meet by November 23, this year, to further the process of determining the matter," said President Magufuli. His counterpart, Ugandan President Yoweri Kaguta Museveni who was biding him farewell after his three-day tour of Uganda, strongly condemned the decision by the ICC, noting that the move was interfering with the on-going negotiations, something which is altogether not right. "The ICC is interfering with issues of the East African Community (EAC) without consulting its leaders; this is impeding efforts that have been undertaken by the community to make peace in Burundi, to which I am the Senior Mediator," challenged President Museveni who is also the EAC Chair. The mediation committee which was formed by the community is also comprised of the third phase Tanzania President, Mr Benjamin William Mkapa who stands as a facilitator. On November 9, this year the Pre-Trial Chamber III of the International Criminal Court (ICC), which was composed of Judges Chang-ho Chung (Presiding Judge), Antoine Kesia-Mbe Mindua and Raul Pangalangan, issued a public redacted version of its decision authorising the ICC Prosecutor to open an investigation regarding crimes within the jurisdiction of the Court allegedly committed in Burundi or by nationals of Burundi outside Burundi since April 26, 2015 until October 26, 2017. Reports further state that the Prosecutor is authorised to extend her investigation to crimes which were committed before April 26, 2015 or continue after October 26, 2017 if certain legal requirements are met. The decision was first issued under seal on October 25, 2017. The Chamber accepted, exceptionally, after ordering the Prosecutor to provide additional information, to conduct the authorisation proceedings under seal and only with the participation of the Prosecutor, in order to ease risks to the life and well-being of victims and potential witnesses. The Prosecutor was in addition exceptionally granted a limited delay of 10 working days, in notifying the initiation of the investigation to States normally exercising jurisdiction over the alleged crimes, in order to prepare and implement protective measures for victims and potential witnesses to mitigate the potential risks. Further reports reveal that Burundi has refused any idea that it would help the International Criminal Court's probe into alleged crimes committed after the country spiraled into political turmoil in 2015. "Burundi rejects this decision from the very outset," said Justice Minister Aimee Laurentine Kanyana, a day after The Haguebased court announced the investigation. Burundi withdrew from the ICC on October 27 -- claiming it was biased against Africa -- "and was not notified of the ICC's decision to investigate Burundi before its effective departure," she said. As a result, "it is not bound by this decision," the Minister said in a statement read to the press in Bujumbura, the capital.